France braced on Friday for another wave of protests against high living costs that could inflict more pain on tourism and transport stocks in the euro zone's No. 2 economy, after retailers, airlines and hoteliers suffered their worst week in months. Air France KLM , supermarket chain Carrefour and electronics store FNAC Darty have borne the brunt of the selling this week, underperforming their peers as the busy Christmas holiday season begins. "The yellow vest protesters could scare away tourists and hit Accor and Air France, while the consumer sector will be hit as many French people will be put off from going out," said Meriem Mokdad, fund manager at Roche Brune Asset Management. The French capital attracted 40 million visitors last year and has more than 2,000 hotels. In the first half of this year, tourists spent some 10.3 billion euros (9.18 billion pounds) in Paris. Much of Paris will be in lockdown and tens of thousands of police deployed across the nation this weekend to contain what protesters are billing as 'Act IV' of the 'yellow vest' demonstrations that has seen the worst unrest in the capital since 1968. 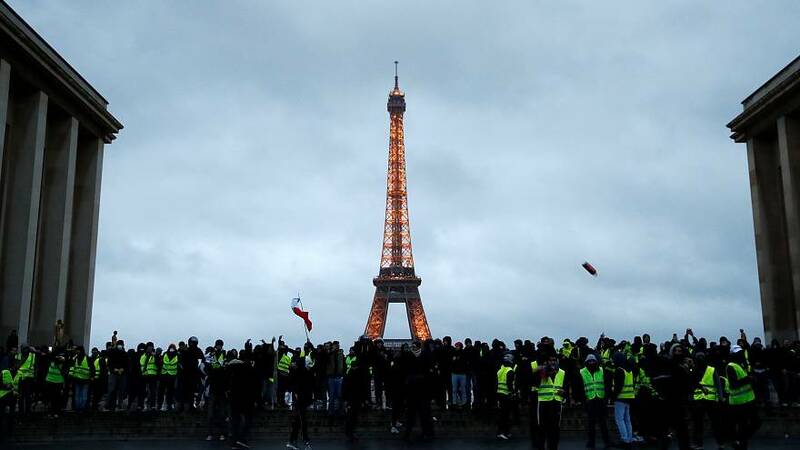 Top-flight soccer matches have been cancelled, the Eiffel Tower is closed, and other popular landmarks are also shutting their doors on concerns about the demonstrations despite pledges on tax reforms from the government. Small retailers saw a big drop in revenue, and the hotel industry lost reservations following last Saturday's protests as rioters torched cars, vandalised cafes, looted shops and sprayed anti-Macron graffiti in some of Paris's most affluent districts. "Last minute cancellations could be on the way in the tourism and transport sector. Accor has shown some relative resilience, Vinci has a strong enough balance sheet to cope, but we are more wary of the impact on Air France," said Pierre Willot, fund manager at Paris-based Montaigne Capital.